IAD (Instructor Assisted Deployment) Parachute Course - First Jump Course﻿. 1 jump. One full day. Complete the traditional First Jump Parachute Training Course - a full day of theory & ground training. IAD - Traditional Solo Parachuting & Skydiving Course Package - 3 jump Introduction package. Complete the 3 solo parachute jumps over 2 days (weather permitting). IAD - Traditional Solo Parachuting & Skydiving Course Package - 5 jump First Freefall package. 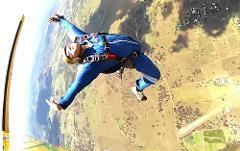 Complete the 4 solo parachute jumps and then your First Freefall over 2 days (weather permitting). IAD traditional Solo Skydiving Course - 'A' Certificate Package - Full Course. 15 jumps over 5 days (weather permitting). The cheapest way to achieve your international 'A' Certificate.